The Abomination That Causes Desolation Is In Our Face And Many Don’t Recognize It – I Am Not Ashamed Of The Gospel Of Christ! The word abomination comes from the Old French word abominacion meaning “horror, repugnance, disgust.” The word abomination can also be used to refer to a person or object you find utterly loathsome and repellent. If you look at someone else as an abomination, that means you are horrified by them, and barely even think they’re human. The condition of a place or thing that has been damaged in such a way that it is no longer suitable for people to live in. Brings the phrase “Abomination that causes desolation” into perspective. This is not meant to be a detailed theological discussion on prophecy. This is meant to warn that so many and yes even theologians have been overtaken by propaganda, and politically correct thesis that they have failed to see the forest for the trees. We have watched as the demons of ISIS and their ideology have left a trail of destruction, death, and chaos that would make the ancient Romans look like amateurs. The speed with which they wreak their demonic destruction rivals even Alexander the greats campaign. The latest destruction is the city of Nimrud. It now lays in ruins, uninhabitable. According to the Smithsonian recent satellite images show total destruction of an ancient Ziggurat in the Ninevah plains. Even they recognize the destruction wrought by this religious belief and war. And we need more signs?? From the coasts of Africa all the way to Syria this religious ideology has left a stench of death and destruction like none other. The have formed alliances, even used by Western and Eastern leaders alike as proxies to plunder and loot and we need more signs? The Book of Revelation and even the prophets of old are coming to life before our very eyes and we need more signs? They, joined by Iran, and the Palestinians, hamas and hezbollah, have made it their goal to conquer Jerusalem! And we need more signs? Jerusalem is God’s holy city. He wrote His name there. But the abomination is already there and threatening to erase God’s name for all time. It’s already begun with the UN claiming only Islam has a history there. And we need more signs? A Nigerian official wrote a letter stating that he was hopeful for a President Trump to stop those put in power by the evil in the government of America to islamize Nigeria, and to stop those like Buhari (put in power by America) and his (buhari’s) ties to the Fulani Herdsmen and Boko Haram. The vicious circle of kings so to speak putting those in power to reward them for following the one world government is in our face. And we need a sign?? ‹ Heavy heart and Word from the Lord! Nobody was more sure than I that we were knee-deep in the book of Revelation and things were about to get very ugly. And, if Hillary was elected I figured the remnant needed to get ready for the guillotine. However, and I could be wrong, it feels like Yahuwah (YHWH) has given us, the USA, a reprieve with the election of Mr. Trump. It appears that he is really going to do what he campaigned on and if that happens this country will pivot away from darkness and towards the one true living God. Time will tell. This entire world is a total abomination unto the living God. Great analysis. Agree, the world has become dark and filled with evil. And an abomination to Him. CJ your article is spot on…. 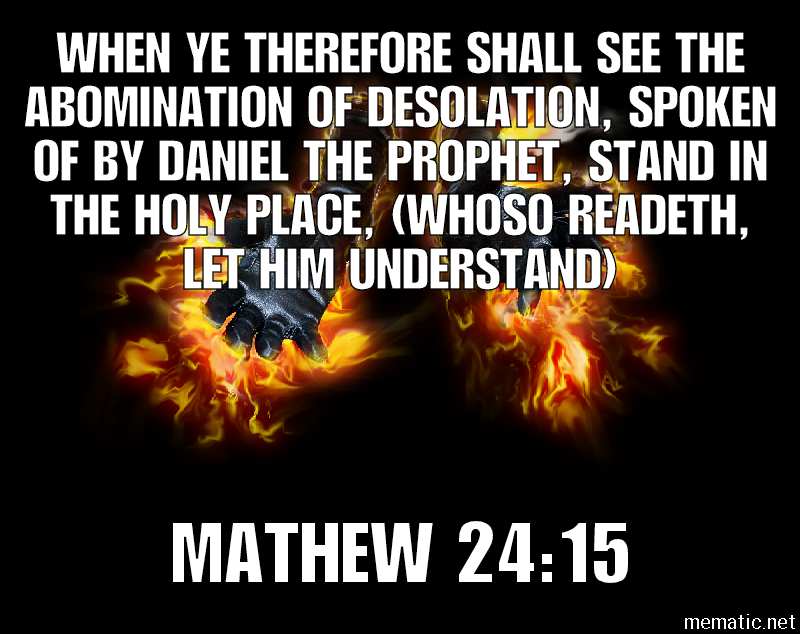 I always thought the abomination of desolation as a person the Antichrist and he has not yet emerged but believe He will soon appear as things get worse. I am not ashamed of the gospel of Christ has an anointing on all the authors and messages it sends and I’m grateful for all of you who speak boldly about Jesus and I’m grateful to stand beside you as we get closer to His return. I truly feel if blessed to have a reprieve and trusting God for all things. The Antichrist will be the leader to so many…. Most the world and we the Bible says we could be fooled ( if it were possible… I take that as sarcasm jokingly cause that ain’t gonna happen 🙂 however I feel like sometimes I am in the invasion of body snatchers because things are changing so quickly and people think such strange things with eyes closed. Praying for us all to have out eyes open as we enter an exciting time to be living…. He trusts us and we will not disappoint because He has never disappointed us!!!! Thank you for your words and support. We know that time is short the evil manifesting and growing all around is is evident of that. Standing in solidarity with God’s word, and the remnant of true followers. Come quickly Lord Jesus. The word Abomination comes from the Greek word. The French word is irrelevant. Your analysis should be coming from the root and not the capillary. Yes! The times our LORD+ warned about are upon us. Your word analysis is very good and proper. Strong’s supports it and Young’s also backs it up, as well as other sources. WE are talking about PROPHECY being FULFILLED. We are not playing word games! Good post and proper and correct scholarship. May The LORD’S+ Kingdom come and the kingdom of death and darkness be destroyed by the Brightness of HIS+ Appearing. Thank you brother and Amen. We stand together.